It’s already been six years since Robert Battle took over as artistic director of the Ailey company. Ailey’s masterpiece Revelations (1960) is still on just about every program over the month-long City Center run (through Dec 31), making the late choreographer’s presence feel disproportionately prominent in the season’s repertory. There are five Ailey works being danced this season—one more than by Battle, who, all the while, has been adding or showcasing commissions and older repertory by interesting dancemakers. Gone are the “best of Ailey” medleys that both awkwardly showcased highlights and underscored how thin some of his dances can be. And on the rise are dances by company members, such as a premiere by Jamar Roberts and a reprisal by Hope Boykin. 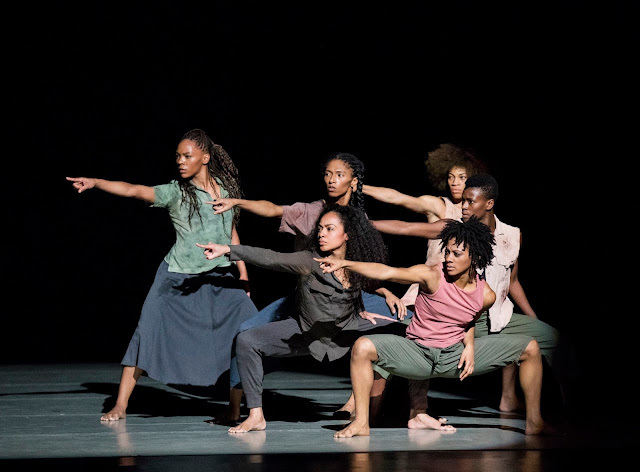 As the company’s repertory has, through time, necessarily experienced a decrease in percentage of Ailey works relative to those by others, to me the Ailey name has shifted to signify less a choreographic style and more the Ailey dancers. Many members have long tenures in the company, and have developed big fan bases, even as turnover continues regularly. It’s not quite a cult, but at this point it is more about the performers than the repertory, which exists mainly to showcase these remarkable artist-athletes. Battle has been quietly remounting older works he has done for his own troupe, or as commissions for other entitities. Seeing some of his classics, like The Hunt (2001), I’m reminded once again of his own stylistic roots which emanate more from Paul Taylor than Ailey. Battle was a long-time member of and choreographer for David Parsons Dance, and Parsons was a Taylor dancer for many years. The Hunt, for six men, contains direct—albeit brief—movement quotations from Taylor’s Cloven Kingdom, such as inverted-curving arms and hunched shoulders rotating forward aggressively. In fact, The Hunt feels like a blood relative of Cloven; both feature men as barely tamed pack animals, alternating between hunting and societal rituals. It’s exciting, a crowd pleaser, and makes use of the dancers’ athleticism. Another Battle work that serves to spotlight physical prowess is In/Side, an emotionally expressive solo; I saw the amazing Yannick Lebrun perform it, funneling his energy toward a powerful finale. And Mass (2004) focuses ecclesiastical fervor into sheer kineticism, as the 16 robe-clad dancers move en masse and form geometric shapes and lines. Chalvar Monteiro distinguished himself with a charismatic presence. Jawole Willa Jo Zollar’s Shelter (1988) counterbalanced The Hunt in terms of gender (six women, although it is performed by a male cast at times) and theme (the prevalance of homelessness in a wealthy society). The spoken text, including poetry, felt slightly didactic at first, but the varying movement dynamics and invention quickly became the driving force. The dancers planted themselves in grounded stances and threw their legs up in high, hatchet-like kicks. The clustered nervously, a wary communal unit on the defensive. In high contrast was Twyla Tharp’s Golden Section (1983), to David Byrne’s score. Few companies could handle the breakneck speed and technical demands, and Ailey essentially fares well; a little good humor offset any panic induced by the challenging choreography. The production was refreshed in 2006, but Santo Loquasto’s gold lamé or mustard velveteen pieces still encapsulate 80s glam. Belén Pereyra-Alem was notable for her precision and focused energy. As for Revelations, it continues to bear up well after constant performance and viewing. There was a time when I didn’t relish seeing it yet again, but now, I look forward to it greatly. Its array of juicy roles are vehicles in which to discover new faces, or see tenured ones try something new. I was greatly heartened to watch Clifton Brown, who returned to the company after a break, in “I Wanna Be Ready,” displaying his amazing gift for delivering maximum emotion from minimal kineticism. And his heartfelt smile in “Rocka My Soul” was truly moving; a prodigal son was back home again—or had he brought a piece of home back to me?